Budget days past more usually brought a certain 'Grand National buzz' to Leinster House. An edge in the air amid speculation of who might go offside, abstain or even vote with the "other crowd", a certain anything-can-happen vibe. The fizz of uncertainty was more usually augmented by the finance minister pulling a rabbit out of his battered Budget bag now consigned to history. There was utterly none of that on this Budget day, where proceedings were for the most part flat and often bordering on the boring. In all honesty that is something of a back-handed compliment to our much maligned "new politics". The third of three planned budgets was delivered with no drama and few doubts - all of that despite the tight Dáil numbers, and the increasing certainty that a general election is not far away now. Many have argued that this Budget 2019 is far too low-key and vastly too short on give-aways to be rated "an election Budget". But taking that view is to miss the low-key subtle messaging which runs right through this document, unveiled yesterday afternoon over 77 pain-staking minutes by Finance Minister Paschal Donohoe. 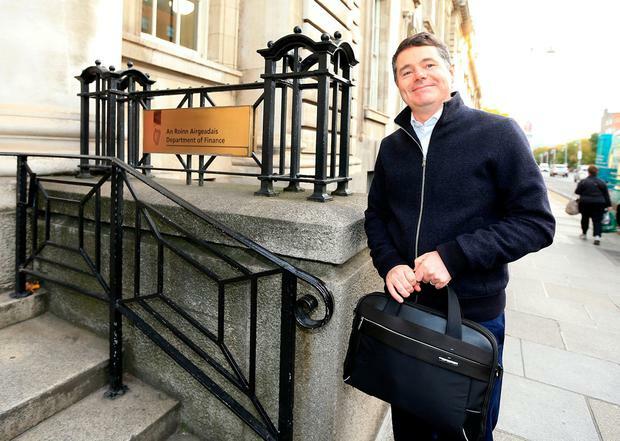 The real indicator of what was going on came when Fianna Fáil's spokespeople were quickly on their feet to claim ownership of large chunks of Mr Donohoe's work. Even though Sinn Féin's Pearse Doherty attacked Budget 2019 with passion and eloquence, he also stressed that it "bore all the hallmarks of Fianna Fáil". In a very intelligent speech, devoid of histrionics, Fianna Fáil finance spokesman Michael McGrath deplored the Government failures on housing and the ongoing problems on health. But after an honest reflection on the awkwardness of his party's position, propping up this minority Coalition since May 6, 2016, the Cork TD went on to argue how much his party had contributed to this and other initiatives over the past 29 months. Change the odd turn of phrase, and delete the odd rhetorical flourish, and Michael McGrath could have swapped places with the Finance Minister across the aisle. For both men the winners were low and middle-income earners. The small-scale income tax changes increase the entry point to the higher rate of income tax for all earners by €750 to €35,300 for a single worker. There's a cut in the third rate of Universal Social Charge from 4.75pc to 4.5pc, and there will be a 25c-an-hour increase in the minimum wage, taking it to €9.80. Older people will get their third consecutive €5-a-week increase in State pension from March and a 50c reduction in prescription charges, taking them from €2 to €1.50. More parents will qualify for targeted childcare subsidies of between €50 and €145 a week, and a €25 increase in Back to School and Footwear Allowance rates, and there will be an extra two weeks of paid parental leave from November 2019. No big give-aways there. Just a series of small incremental measures which are hopefully affordable and even more hopefully might be perceived as helpful in a small way. A certain "sharing and caring" trend in all three of these budgets. That may be exactly what Fine Gael and Fianna Fáil now hope the public will reciprocate at the ballot box after this election Budget. It was, we stress, the pitch by both parties yesterday. And we can already see two problems with it as a political sales pitch. Firstly, it may be too subtle for the noisy world of electioneering. Secondly, it poses a little puzzle to the voter since both parties seem to be saying the same thing and claiming authorship of things which are good. On a day where there were few visible losers, there was just one clear victim, the hoteliers and tourism generally. The switch back to the 13.5pc VAT rate was keenly argued by both big parties. It was pitched and pushed as "a good thing". Mr Donohoe devoted a half page of his speech in defence of the change. He recalled that the tourism sector was battered when the 9pc rate was granted as a kind of emergency aid in 2011. But it had since gone from strength to strength and generated tens of thousands of jobs. The change would deliver €466m, a very valuable chunk of revenue, which could plug a lot of holes. Again, when it came to Michael McGrath's turn, he fully endorsed the minister's message, adding an important grace note that back in 2011, it coincided with a government raid on pension funds which would leave retired people with permanent consequences. It may be too harsh to categorise the tourism sector, especially hoteliers, as "popular victims", especially given the large numbers who depend upon that industry for their livelihoods. But there was a sense of contentment among many within Fine Gael and Fianna Fáil that much of any recriminations may be directed at Tourism Minister Shane Ross. Yes, the Budget did speak to the key issues of our time: the crisis in our housing system; the chronic difficulties in our health services; and the huge threat of Brexit fallout. For our two biggest crocks, Mr Donohoe opted for superlatives. His Budget would be the biggest housing spend in this country for a decade; and it would be the highest spending ever in our history, topping €17bn in 2018. All well and good, we hear you say - but will it deliver a serious number of new homes? And will it reduce the A&E queues, shorten waiting times and mean fewer people on hospital trolleys? History will not encourage the rest of us to opt for superlatives just yet. The Government tells us the blockage on housing supply is about to be freed up - others contest that view. Mr Donohoe dubbed Brexit the "political, economic and diplomatic challenge of our generation". He announced budgetary measures worth more than €710m which he insisted would protect against its effect on Ireland. Yet there was another overlooked loser in Budget 2019 - the environmental lobby who have long been advocating initiatives to tackle the ticking time bomb for the planet that is global warming. Plans to increase the carbon tax as part of the fight against climate change have been long-fingered until future budgets. We are reminded that there are no votes in being seen to do something for future generations. We are further reminded that diesel is the staple fuel of middle Ireland, a recurring and real budgetary item to be reckoned with. The furthest Mr Donohoe would go was a 1pc VRT levy on new diesel vehicles. The message? Mess with the diesel and lose votes.